Amongst other things one of the projects I have been working on recently is character illustrations for The Royal Shakespeare Company exhibition, “Who Wears The Trousers”. I and several other female illustrators were tasked with exploring the tradition of cross dressing in theatre and how we use clothes to express our personalities. For the project I created 3 characters adorned with tattoos (I do love sneaking animals into my work wherever possible) and wearing colourful contemporary clothing. All the illustrations have been applied to mix and match blocks and joined together to create different life-size characters that visitors can interact with. For more photographs of the exhibition have a peak at the portfolio section of my website. If you'd like to find out more about the exhibition (that is on display until the end of August), please follow the link http://www.rsc.org.uk/whats-on/exhibitions/who-wears-the-trousers.aspx. Etsy Shop up and running! A quick update to share the news that at LONG last I've got my Etsy shop well under way, just in time for the fast approaching festive period. I've just launched my new range of Christmas cards so when you have a minute why not take a peek. You can find the link here . Once again it's been a while since I last posted, what can I say when a girl's busy with her pencils everything else goes out the non-crafty-window! So as you will see from my newly updated links section, The Kite Princess is now on sale which is really exciting and lovely to see the finished thing in print! 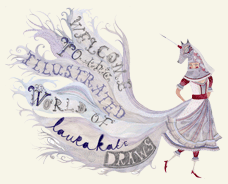 I have also delved into the big bad world of Twitter, so you can now follow my arty goings on @LauraKateDraws. I must admit it feels a little bit like learning a new language, all this #business is still rather riddle-like to me, so Imust warn you a few tweets may air on the dodgey social media illiterate side. I have a new found understanding for the trouble Momma Chappers had when learning how to email! I have been very busy the past few months organising new Capstan's Bazaar fairs at LEAF and other new venues (more exciting news coming soon). With new craft fairs comes the development of new Laura-Kate Draws prints and products, which is my most favourite of ways to spend time. That said, I have embarked on making my illustrations wearable, in the form of hand-painted/hand-drawn jewellery and screen printined T's. All in time for Summer festivals! To see what I've been up to take a peak at the portfolio section of my site. In other news, for the past few months I've been creating bespoke gifts for a variety of people, which has been most lovely. After all there is nothing better than getting a truely unique and special present and for me being able to create that is an absolute joy! You can see the range of pieces on the newly updated "Weddings and Special Gifts" section of my portfolio. I think that is enough updating for one day, but I shall depart for a cup of tea with a promise, (that this time I will keep) to update you all more regularly. If in doubt though, do follow me on good old Facebook as I am much better at keeping things current in this arena- HONEST! I've not just been a hermit locked away quietly working away on the book, I've been working on a number of other projects, workaholic springs to mind! I was honoured to be asked by one of my very best friends to design her wedding invitations which were such a lovely little project to create something for someone's most special day. Luckily she loved them and the day was wonderful! I've been kept quite busy with special occasions of late, creating bespoke gifts and illustrations as presents for people's friends and family. Which is something I am eager to do more of and I am thinking of offering this as a new Laura-Kate Draws service. Dropping off the face of the planet! Look what I found photo of my flyer design for the Winter Arts Market from it's big screen debut outside Lime Street! Toy stores and sugar cubes! I have been in demand overseas recently which has been a very happy development. I've been working on a great brief for a Toy Store in Australia creating a logo and some eccentric charceters for the identity of their brand new store so here is a sneak peak of what I have been working on. It has been a brilliant project to work on and Robyn at The Village Toy Store has been fab , giving me complete creative control. I spent much of the first week in March drawing magical Bee characters and logos for the rebrand Baeshen Bee Sugar Cubes in Saudi Arabia. It was an unusual and challanging project, trying to push the boundries of the companies vision for the packaging. Unfortunately Saudi was not ready for the weird and wonderful vision of Laura-Kate Draws and my design was not chosen. However I have some lovely drawings that materialised from the project that I will post online soon. My first craft fair of the year was a couple of weeks ago at LEAF TEA Shop on Bold Street and I will be there again on April 2nd so come down and bring your mum cakes, tea and treat her to some some beautiful crafty gifts! HAPPY NEW YEAR!Hope 2011 is treating one and all very well so far. Apologies for the late New Year greetings but I have been a busy bag lady, moving to my new abode.Moving house is stressful enough but when you are a collectomaniac with 3 suitcases full of accessories, another 3 full of shoes and don't even get me started on the sketch books, it gives a whole new meaning to the word stressful. However I am finally in and my new studio is starting to take shape, I managed to bad a vintage cabinet for just £2 to house at least some of my drawing equipment. Must apologise for my last news post, chattering on about art crank when I'd already done enough waffling about it in the previous post. It is hard to keep up with myself sometimes, if it wasn't for my diary I'm pretty sure I wouldn't know what day of the week it was. Aside from moving I am busy with a few private commission pieces for people, today I have been drawing lions and cats all suited and booted in wedding attire. Before Christmas I did a little commission piece for the lovely Christina at Open Culture, to welcome her friends new born baby boy into the world. I am hoping to be opening an Etsy shop soon so watch this space. Once again it's been far too long... luckily I am MUCH better at updating my Laura-Kate Draws facebook page. I was chosen to be part of the ARTCRANK exhibition in London which is the 1st time the exhibition has been hosted in the UK. I went down to the opening of the exhibition and was blown away by the quality of all the splendid bicycle inspired artwork. It was a really fantastic opportunity and lots of Laura-Kate Draws prints were given new homes!Probably shouldn't admit that the last time I was on a bicycle was on my travels in Indonesia, I studpidly wore flip flops, fell off the bike and took half a toe off! I have been busy sending lots of work off to galleries for exhibitions including the "Objects of Desire" exhibition at the Chapel Gallery in Ormskirk and the Christmas exhibition in the Shire gallery in Stafford, I have my fingers crossed for lots of pre Christmas sales. Craft fairs have been hectic on with the run up to Christmas so much of my time has been spent making new bespoke pieces for my new one off ceramic range, which you can now find on sale through FOLKSY (see the shop section of my site). Luckily we have a new indoor venue at LEAF TEA SHOP on Bold Street so I haven;t lost any of my fingers to frost bite! The Winter Arts Market at St Georges Hall was again a brilliant event and I was honoured to be asked to design the flyer for the event, and got to see my design on the big screen outside Lime Street which was rather surreal! I am currently working on the logo and identity for a new Toy Store in Australia which has been a really enjoyable project to be part of. Recently I was asked tom illustrate a fairy tale for the Magazine "New Fairytales" which was a lovely project, check out the new issue on line now, you can't find the link through the links section of my site. I have been very busy with developing personal projects, private commissions and orders that have been coming through thick and fast so lets just hope it continues into the new year. Well summer is over although not sure it ever really arrived my umbrella has been far to over used! I have been busy over summer with a camper van holiday, craft fairs and creating new work. A piece of my work is in an exhibition in London called Artcrank www.artcrankpostershow.com/london/ so I have been drawing lots of old bicycles,my particular favourite being the penny farthing. I went to London for the opening last week and it was brilliant,extremely busy indeed and received lots of positive feedback about my work. I have been out of the technology loop recently as I have been stuck in the world of broken down laptops. I would like to shake my fist at the pesky creators of computer viruses! On a much lighter note I have been busy creating... I've been craft fairing like crazy and had a very successful weekend at the Lord Street Celebrates event which was the first time my work graced the shores of Southport. I even got asked by a customer to sign some of my badges which was funny but very sweet, I think it was my first five seconds of fame. My work was featured in last months cosmos issue of Blanket Magazine and I was asked to create a colouring book spread for Anaroks latest Birds Issue http://www.anorak-magazine.co.uk/index.php/issues. Three of my illustrations were chosen by The Art Corner to be part of their exhibition "Therianthropy" at Trof in Fallowfield. Whilst my computer has failed me my trusty 0.3 pencils have not! Check out the shop section of my site which is now updated. Hot of the press here's the promotional gig poster I've been working this week for an upcoming night at Mello Mello in Liverpool called "Dance on toast". I got a little bit carried away drawing strange monsters with an apptitude for playing musical instruments wearing hats and dancing/ throwing toast around, always good to have a bit of creative freedom. So don your dancing shoes and get down to Mello Mello for abit of dancing on toast. Fantastic news for Laura-Kate Draws- during the Indigo Exhibition one of my patterns sold to the gorgeous fashion retailer The White Stuff which is really exciting.I can't wait to see how they use the design on their garments. I am now in the process of putting together a mini portfolio of all my patterns to send out there into the world of fashion so lets hope more sales continue. Back up and running and GO PENGUINS! I was kept nice and busy from October to January with the invasion of the Go Penguins around the city. I was lucky enough to be chosen to design and paint my own penguin (named Blizzard) that went on display at Lime Street Station which meant lots of long hours painting a 5ft tubby penguin in my PJs at the Innovation park. I was also out in the city 2 days a week with my trusty painting kit as a penguin vet making sure all the Go Penguins were kept looking tip top, which was very cold work. During the run up to Christmas I was all over the city taking part in various craft events selling "Laura-Kate Draws", products and prints. Sales were fab and thanks to all you lovely people who bought Christmas presents for your friends, family or even just treated yourself to lovely new mug! My alphabet sold to Custo which was fantastic news and my images should be going to print for a small collection in January so watch this space. Since then I have been working on a number of small projects including music posters for the Manchester music event Unconvention, an advert for a lovely caf in Liverpool (get yourself down for a brew and a fry-up), some wonderful winter themed wedding invites and creating quirky circus characters for a lovely little lady called Jasmine-Rose. The biggest project I've been working on for the pat few months has been the dreaded business plan with the help of the fab team at LJMU Business Enterprise and the wonderful Nikki Chowdery at Train 2000. So look out for lovely Laura-Kate Draws mugs, T-Shirts and lots of other beautiful things at craft fairs around Liverpool! My mugs are already selling in Land Baby in the Blue Coat court yard so take a stroll down, buy one and have the best looking brew ever! I was over the moon to find out that two of my pieces sold to the popluar spanish clothing company,"Custo Barcelona", and with the possibility for further collaboration it's good times all round! I've just completed a variety of hand drawn patterns and images for a fashion and homewares exhibition, "Indigo", in Paris. Lets just hope my work is well recieved and sells to the industry big wigs!